Katherine Anne Porter whose new book, THE COLLECTED STORIES OF KATHERINE ANNE PORTER, is published by Harcourt, Brace & World. This volume contains all the stories from FLOWERING JUDAS; PALE HORSE; PALE RIDER; and THE LEANING TOWER, as well as four stories not previously published in book form. Katherine Ann Porter (15 May 1890 – 18 September 1980) was a celebrated American journalist, essayist, short story writer and novelist. She is known for her flawless prose and penetrating psychological insight. Her works deal with dark themes including justice, betrayal, and the unforgiving nature of the human race. 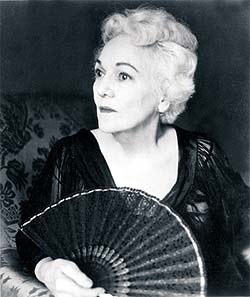 Katherine Anne Porter was born Callie Russell Porter in Indian Creek, Texas to Harrison Boone Porter and Mary Alice Jones Porter. She was the great-granddaughter of legendary American frontiersman Daniel Boone. After her mother’s death in 1892, Porter’s father took his four surviving children to live with his mother, Catherine Ann Porter, in Kyle, Texas. The family lived there until her grandmother died in 1901. The depth of her grandmother’s influence on her can be inferred from Porter’s adoption of her name later in life. After her grandmother’s death, the family lived in several towns in Texas and Louisiana. She was enrolled in free schools wherever the family was living, and for a year in 1904 she attended the Thomas School, a private Methodist school in San Antonio, Texas. This was her only formal education beyond grammar school. Also in 1915, she was diagnosed with tuberculosis and spent the following two years in sanitoriums. In 1917, she began writing for the Fort Worth Critic, criticizing dramas and writing society gossip. In 1918, she wrote for the Rocky Mountain News in Denver, Colorado. During her time there, she almost died of influenza. This experience provided inspiration for her later story Pale Horse, Pale Rider. In 1919, she moved to Greenwich Village, and made her living ghost writing, writing children’s stories and doing publicity work for a motion picture company. This year in New York City had a politically radicalizing effect on her. In 1920, she went to work for a magazine publisher in Mexico and became acquainted with members of the Mexican leftist movement, including Diego Rivera. Eventually, she became disillusioned with the revolutionary movement and its leaders. During this period, she also became intensely critical of religion and remained so until the last decade of her life when she again embraced the Roman Catholic Church. Between 1920 and 1930, she traveled back and forth between Mexico and New York City and began publishing short stories. She continued to depend on essays and book reviewing for financial support. In 1930, she published her first short story collection, Flowering Judas and Other Stories. It received such critical acclaim that it alone virtually assured her place in American literature. During the 1930s, she spent several years in Europe during which she continued to publish short stories. In 1930, she married Eugene Pressley, a writer 13 years her junior. Upon returning from Europe in 1938, she divorced Pressley and married Albert Russel Erskine, Jr., a graduate student who was 20 years younger. They divorced in 1942. She did not marry again. For the next 20 years, she continued her writing and spoke out against totalitarianism, and against the excess of Senator Joseph McCarthy. She also became a mentor to younger writers, including Eudora Welty, Eleanor Clark, William Humphrey, and Peter Taylor. Porter worked sporadically for 30 years on her only long novel, Ship of Fools which was published in 1962. Porter lived in and around the Washington, D.C. area for the final 18 years of her life. She continued to write and publish, and received numerous awards, tributes and honorary degrees. She died in Silver Spring, Maryland in her 91st year. Her ashes are buried alongside her mother’s grave in Indian Creek, Texas. Do you have any comments, criticism, paraphrasis or analysis of this poem that you feel would assist other visitors in understanding the meaning or the theme of this poem by Katherine Anne Porter better? If accepted, your analysis will be added to this page of American Poems. Together we can build a wealth of information, but it will take some discipline and determination.